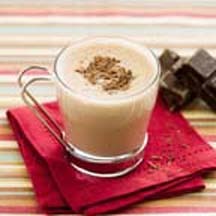 Holidays are the perfect time to try something new, so why not start with this eggnog with a chocolate twist. Combine Nesquik and eggnog in large pitcher or bowl; refrigerate. Pour into glasses. Sprinkle with nutmeg.